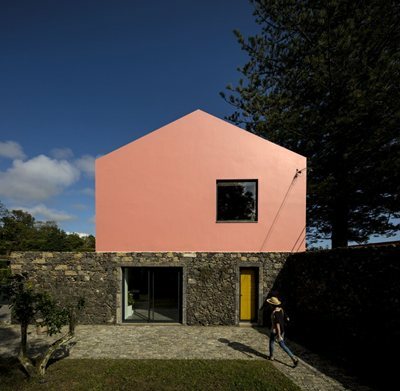 In the Atlantic island of São Miguel, in the Azores, an old stable from the beginning of the 20th century was converted into two guesthouses where history and contemporaneity coexist in balance. The design's main goal was to keep the construction’s character, lines, and its rural atmosphere, while adapting the enclosed structure to a completely new typology and contemporary regulations. New openings where carefully shredded in the colored façades, as well as on the stone wall, and a new volume was added to the main construction, allowing for a second, smaller house to appear integrated in the whole. The bigger house develops in two levels: the ground floor opens to the surrounding exterior spaces and reaches out to it's different heights, creating a semi-level floor where a social space gives access to the private suites and service area. The upper floor contains the social spaces and it was designed as a free plan so it could be taken advantage of the roof's structure and it's full height. From the ochre kitchen there’s an access to a terrace situated on top of the smaller ground floor house. New elements, as the exterior stairs, connecting the outdoor terrace, or the use of whitened wood in the interiors, are re-interpretations of the Azorean vernacular architecture, which was important to dignify. The aged pink and ochre tones are the main identity of the area where the building sits. The ochre was traditionally used to frame windows and doors, at Pink House it was used instead on the bedrooms interior shades and kitchen, adding a new kind of relation between inside and outside views. The interiors and custom made furniture were carefully designed in order to create a neutral and peaceful atmosphere, allowing the garden views to be proeminente on the inside spaces. Local cryptomeria wood ( japanese cedar) was used abundantly for construction and furniture and old wooden beams of pine and acacia, found on site were converted into custom made tables. Cosa unisce Architettura e Musica? Il Colore!